I had never made an Orange Cake before and I have tried and was really pleased with the result. . I used two whole oranges which give it a fiercely fruity flavor and deep orange color and Raisins made for a great mouth-feel and a true tasting pleasure. It’s a feast for the eyes as well as the tongue! The cake was light and spongy with orange zest in every bite when I’d finished this cake and was enjoying the wonderful moist texture. 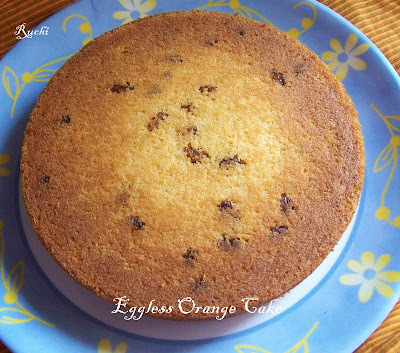 It’s really easy to make and the end result is a delicious, moist, extremely tasty cake. . ‘Orange Cake’ is a perfect tea time snack which is a great hit in my family! 1. Preheat the oven to 180C (350F). Lightly grease baking pan. 2. Sift together the flour, baking soda and baking powder in a bowl. 3. Now add melted butter and sweetened condensed milk and mix. 4. To the prepared flour mix add Raisins and orange zest and mix well. 5. Add the orange juice, orange zest and flour and Mix gently to incorporate the dry ingredients with wet ingredients and pour into the prepared pan. 7. Let it remain in the tin for 10 minutes, then turn it out onto a wire cooling rack. 8. When the cake is completely cool Enjoy with a hot cup of tea or coffee!! 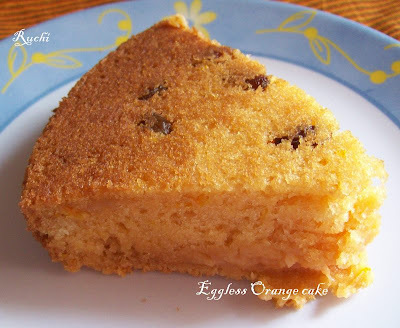 Love the orange flavor... so refreshing..
Spongy and super soft cake looks fabulous and delicious..
nice.. i made a orange cake too recently..yet to post mine..
Cake looks soft and fluffy with a good colour,can feel the aroma of orange from there.. I too love orange flavored cakes,looks super moist and soft! Akka, Made it other day. Very tasty and parents and in-laws loved it. Additional bonus is no eggs which is good for conservative families. Very moist and tasted very good. Thanks for sharing the recipe.